This took a little research, because some of my last-January reviews were of books I'd read in December. Which means that I disqualified Tolstoy, whose Anna Karenina I reviewed this year, but according to Goodreads had finished reading just after last Christmas Day. To my surprise, it wasn't easy to pick ten. I'd forgotten how many good books I'd read early in the year. Have you read any great new-to-you authors this year? Feel free to praise them below. I'll need some new ones to include on next year's reading list, after all. I love the Giver - and I need to re-read it, it's been too long. 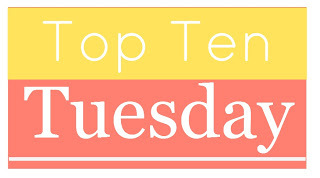 My top ten tuesday post is here. Ooh, great list!! Jessica Day George and Gail Carson Levine are some of my favorite authors! I read several excellent and some promising YA authors. I don't think I discovered new adult fiction authors I'd rave about, though there were new books by old favorites, yay! I can't believe I'm admitting this, but I've never read The Giver. Horrible, I know. Jessica Day George, read Tuesdays at the Castle. Seems to come up a lot among other people too. Katie Schuermann, He Remembers the Barren. A really excellent book written for Christian women who struggle with barrenness. I think it's also an excellent resource for a pastor & also for men who also struggle with infertility. It spoke to me in both of those aspects. Nikolai Gogol, read a few of his short stories. As much Russian literature as I've read, I never got to Gogol until this year. Need to read more. Sybil Nelson, Priscilla the Great. Fun, fast paced, mostly comic Girl Power story. First in a series. Joseph Delaney, Last Apprentice: Revenge of the Witch. Diana Peterfreund, For Darkness Shows the Stars. A science fiction reworking of Jane Austen's Persuasion. David Dickinson, various Mycroft Holmes adventures. Timothy Bontrager, The Palm Sunday Tornado, fictional story incorporating details from the 1965 Palm Sunday Tornado Outbreak. I still need to read the Peterfreund book. The Schuermann work looks good. I just hopped over to her blog and found it thoughtful and encouraging. Haven't been to her blog but I'm glad you found it helpful. It's not often that I miss not having children but there are times when it does hit me & oftentimes a bit hard.